Nearly half the pleasure of a backyard pool is lounging in the sun on the pool deck. Well-designed poolscapes include all the comforts and hosting benefits of any outdoor lounging space, with a few distinctive pool-specific details. Creating the perfect poolside layout requires a bit of creativity depending on your space. It’s important to balance shade with direct sun, especially as the day goes on and the sun shifts position. All outside seating ideas should also keep safety in mind as well, especially when gathering large groups by the water. Outdoor seating ideas for a pool are limitless, whether your space is expansive or quite intimate. Explore a few poolside furniture ideas for ultimate relaxation and hosting. The iconic poolside staple, chaise lounges serve as the perfect spot for taking some quiet time by the pool with a book as well as hosting large parties of family and friends. When choosing the best chaise lounges for your pool deck, be sure to select weatherproof materials that stand up against long-term sun exposure, wind and rain. 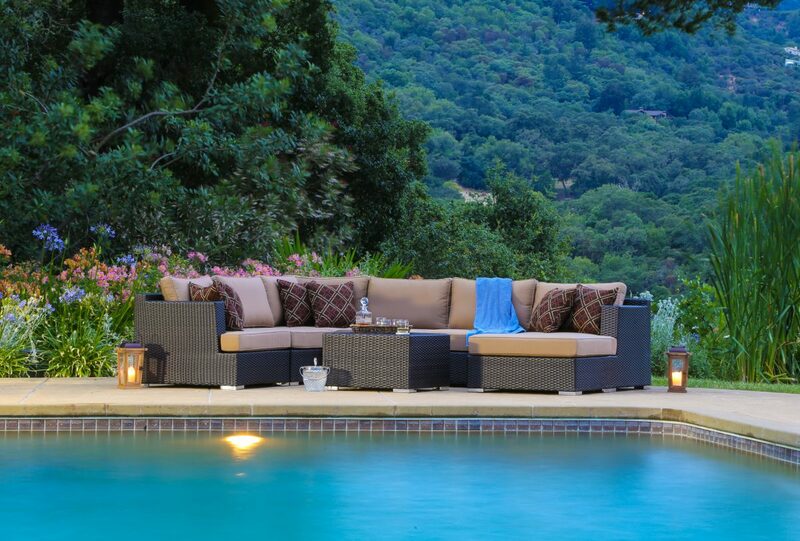 Though they need to be lightweight enough to shift around, all poolside furniture should be sturdy enough to withstand gusts or sudden storms. Accessories your chair lounge seating area with a set of poolside tables, great for holding drinks, snacks and your sunglasses as you rest by the water. The whole set should also add a sense of style to your poolside seating space, adding a classic or modern flair to the whole poolscape. When you find yourself frequently shifting and adapting your outdoor seating, modular patio furniture is the best poolside option. Outdoor modular patio furniture joins together into long couches and breaks apart into individual seating and tables. Reconfigure the lounging set’s direction to build a daybed or chaise lounge or create small pockets of paired seating on either side of your pool. Its durability paired with plush cushioning makes this an ideal outdoor seating idea choice. Creating pockets of shady comfort is the most important thing in such a sun-filled outdoor spot. When you spend a good deal of time lounging outside, balancing your time between sun and shade is just as much about safety as it is about comfort. If you don’t have a ton of natural shade in the area, consider a range of patio umbrellas surrounding your outdoor seating spot. 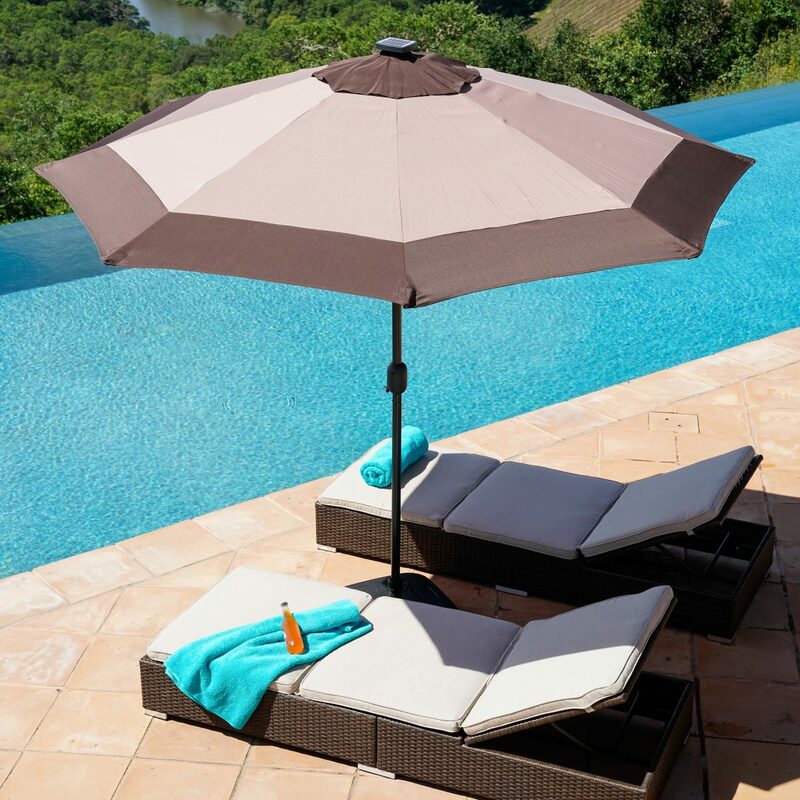 A traditional patio umbrella with a weighted base is the most traditional go-to and resort-style umbrellas adjusts to hang over a larger outdoor seating area. If you have a dining space outside, be sure to keep your guests comfy with a built-in umbrella either attached the table or hanging over the space itself. Poolside barbecues become a bit easier with a dining table to gather a circle of friends and family for a full meal. Lay out your whole spread with room to spare by choosing an extensive dining set or set up a night of wine and cheese on a diminutive, two-person bistro set. The outdoor dining set acts as an excellent focal point for balancing the whole outdoor look. Guests can gather around the table to catch up and kick back, while still taking in the comforts of the pool. 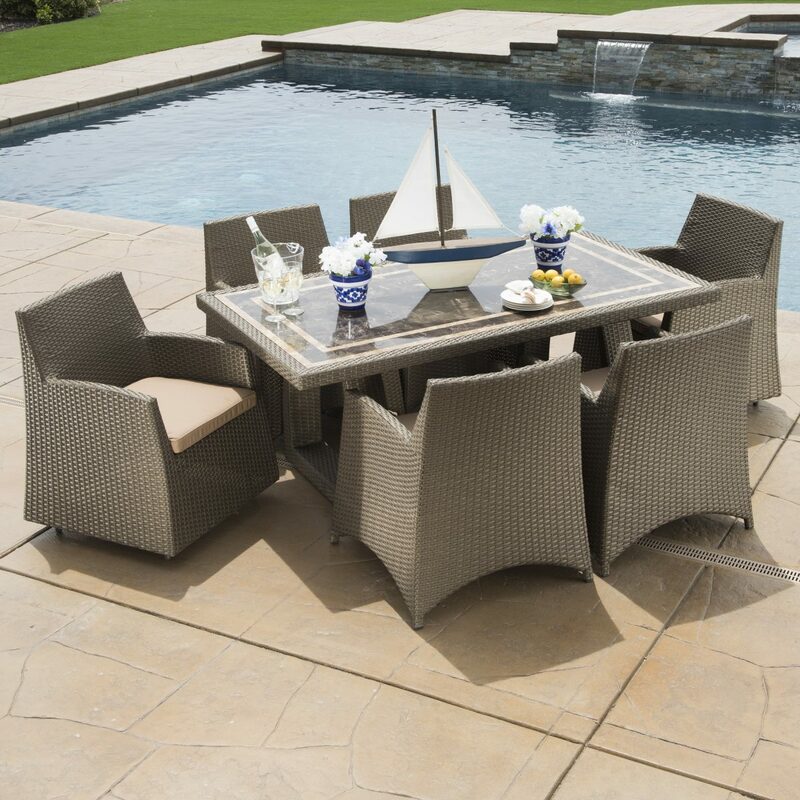 Be sure to consider the proper positioning of an outdoor dining set and bistro table—chairs should always pull out with plenty of room to pass around the edge of the pool while remaining convenient for everyone gathered around the food. A roaring fire pit, especially next to the ambient calm of a pool, is the perfect spot to kick back on summer evenings. 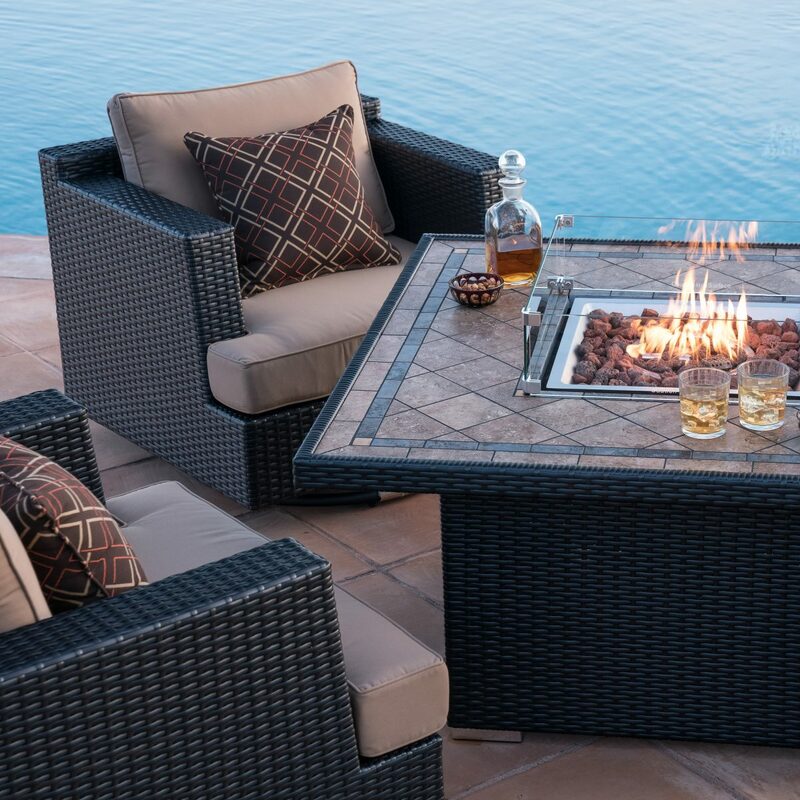 A fire table provides a safe and modern approach to an outdoor fireside. Arrange your modular furniture set around the fire for a night of group conversation or create pockets of hosting areas throughout a larger space. Either way, adding fire elements beside a pool are perfect for drying off after a late-afternoon dip. When laying out your pool furniture ideas, you should keep safety and flow of movement at the forefront of your mind. Maintain several feet of space on either side of each chair, poolside table or chaise lounge, ensuring proper space from the edge of the pool. In the evenings, install proper outdoor lighting to illuminate each pathway, seating area, and fireside spot. Adding lighting within a swimming pool is also a great design tip to consider. 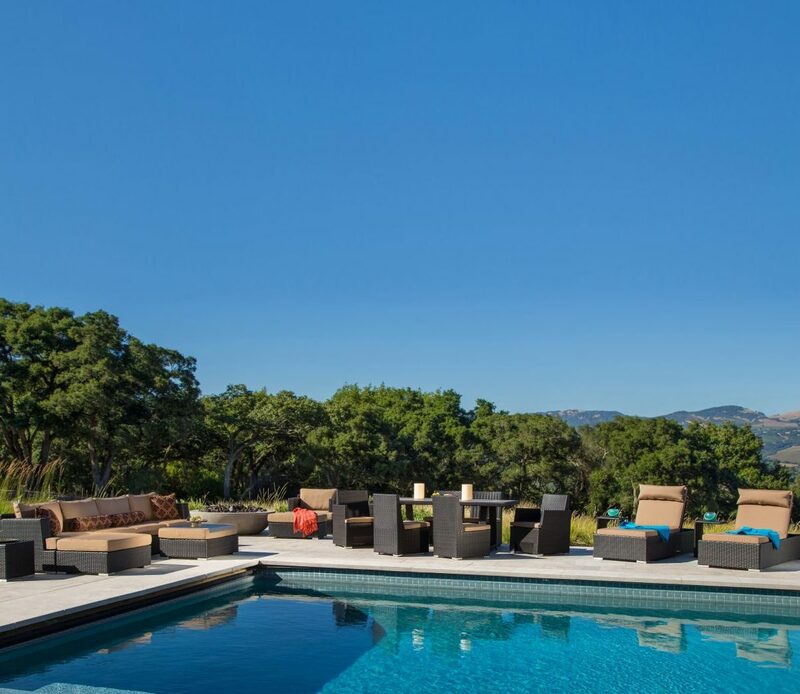 Having the right poolside furniture elevates your entire swimming and lounging experience. 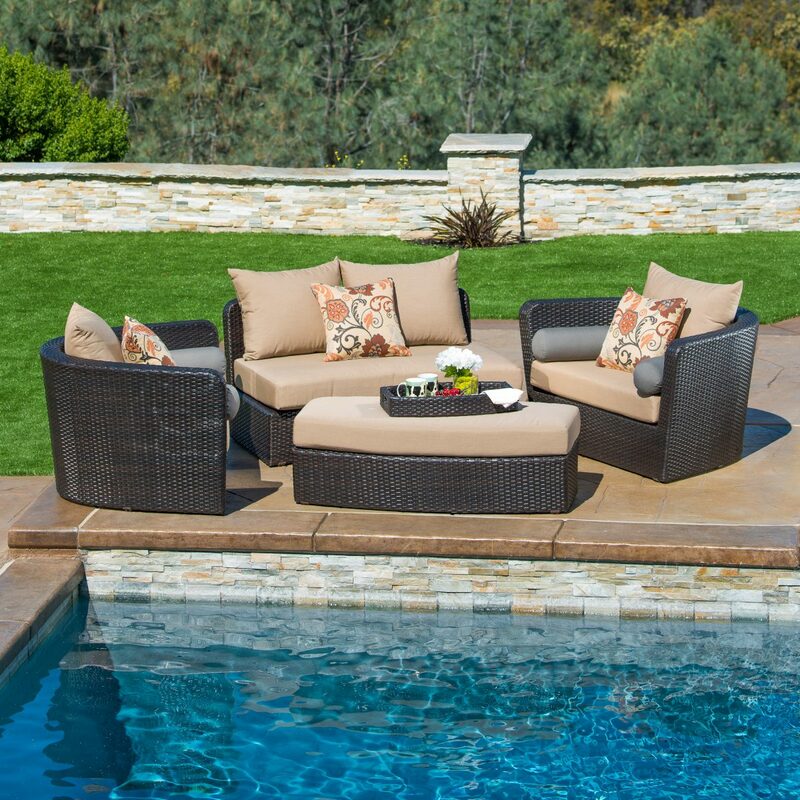 Whether you’re floating around on a pool tube all afternoon, kicking back to soak up the sun, or hosting a fun pool party for your friends and family, be confident of your space with the right poolside furniture that suits your styes and needs.